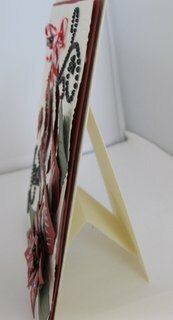 The Creating Card Stands Tutorial will show you some novel ways to display your cards for any size that you make. When I first started to make cards I used to add inserts with verses on them ...but all too often people would like the card and the verse was wrong or liked the verse but the card was not the style they wanted. And so I was left with the card. 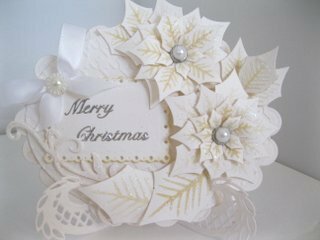 It didn't take me long to realise that this was not the way to go and so I stopped adding inserts to my designs and just made the front to the card instead. But then came the problem of how to present the card in a suitable way for the recipient to be able to display it. The idea of a card stand was born and one of the first ones I did was the simple "A" Frame that I attached to the back of them. I included the instructions in some of my videos but I thought that a seperate tutorial would be better. 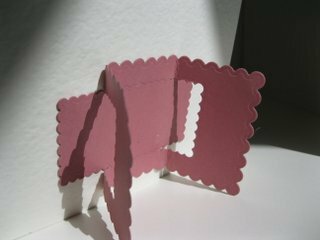 So here for you is the Creating Card Stands Tutorial and I hope you will find it a useful ways to finish off your cards without the need to add an insert. This will show you several ways to make those designs stand for themselves and so be displayed beautifully by those lucky enough to get one of your creations. Find suitable verses and sentiments that can be added to the front of the card instead. "Handmade by ... your name"
Another way to create a stand would be to put to good use any Spellbinders that you have in your collection. This one is created with just the oblong dies but you can adapt many of them to work for you. The video shows you clearly how to get the look and the central strips of card are to prevent you from cutting through the card with the smaller die and so creating a frame instead of a stand. This pretty frame is one I really liked the look of it. I found mine on Ebay for a really good price and there are several styles for you to choose from. These card stands are really pretty but they are not big enough to support larger cards. You will need to restrict the size that you add or the whole lot will just fall over.... not good!! But even if you don't want to buy these or you don't have any Spellbinders there is still a card stand that you can create freehand for all your cards no matter what the size. So in this Creating Card Stands Tutorial I have shown you four ways to make these display stands for your designs and now there is no excuse not to make them.